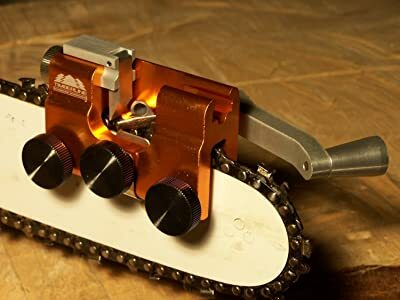 The saw chain is one of the most important parts of a chainsaw. It is responsible for cutting and without it, it is impossible to operate the chainsaw. For the saw chain to be efficient and to last for a long time, it must be maintained regularly. A chainsaw that is in good condition is also safer to use. When handling a saw chain, it is imperative to take safety precautions and to wear protective gear at all times. All chainsaw users should wear helmets, chaps, ear protectors, protective shoes and other safety gear in order to minimize the risk of sustaining serious injuries on the job. It is important to keep in mind that the saw chain is a very dangerous tool that can cause serious injuries if not handled with care. Before using a chainsaw, always check to ensure that the saw chain is in good condition. If some of the cutters and depth gauges are damaged, replace these parts before attempting to cut wood using the chainsaw. Using a chainsaw with worn out or damaged teeth increases the risk of kickback. When operating a chainsaw, hold it with both hands and ensure you’re your feet are well-balanced. Don’t attempt to operate a chainsaw when drunk or when under medication. Even a momentary loss of concentration can cause you to lose balance which can have serious consequences. Operating a chainsaw is always dangerous but operating it at difficult angles should be left to professionals. Only use it to cut small limbs and to saw wood that is on the ground. However, you should never attempt to use it to cut trees or limbs which are higher than your shoulders. This is because it is easy to lose balance and trip or have the chainsaw fall on you. This can cause serious injuries and even death. Using the tip of the chainsaw to cut wood should also be left to professionals. While it may be essential for some types of sawing; this however raises the possibility of kickbacks. This is why it is best left to professional chainsaw users. Always carry an extra saw chain whenever you intend to use a chainsaw. This is in case the one you are using either becomes dull or damaged. Having an extra chain will allow you to change the chain and continue with your work without wasting too much time. A sharp saw chain can cause injury even when the chainsaw is not running. It is important to get a chainsaw case that can be used to carry and to store the chainsaw. This will not only prevent injury, it will also protect the saw chain from being damaged. Always ensure that your saw chain is lubricated whenever it is in use. However, not all types of oil are suitable for chain lubrication. Motor oil and other types of oil are not viscous enough and are usually thrown off when the chain is moving at a high speed. This is why it may be important to check the owners’ guidebook in order to confirm the viscosity needed for a particular chain. 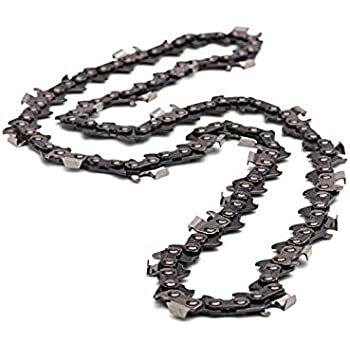 Chain oil has superior adhesives that are intended to lubricate the chain without being thrown off even when the chain is moving at a high speed. While motor oil can be used occasionally during emergencies, it would need to be reapplied often in order to keep the chain lubricated. A saw chain has cutters that are responsible for cutting and depth gauges which are responsible for controlling the depth of the cuts. If these parts are chipped or damaged, they can cause kickback accidents which are the main cause of chainsaw accidents. This is why it is important to constantly check for wear and damage on chainsaw teeth and replace them to ensure that the saw chain operates efficiently and to minimize accidents. Dull teeth decrease the cutting efficiency of the saw chain and increase the risk of kickback accidents. Sharpening your saw chain frequently will reduce the possibility of kickback accidents from occurring.